View More In Reusable Bags. - Internal spring pops it up for easy use. - 3 sturdy carrying handles. - Strong durable polyester fabric coated. - Can be easily folded for quick storage. - Collapsible for space-saving storage. Hand washing recommended. Do not put in washing machine. LARGE CAPACITY GARDEN BAG: This pop up garden weed loader bag with a handy pair of gardening gloves holds up to 30 gallons of garden wast. SMART POP UP DESIGN: 18 inch wide and 20-inch tall garbage basket bin that folds down to a compact 2 inches high has a flexible yet hard spiral spring spine that allows it to automatically pop up into a spacious cylinder without any fiddling or fuss. DURABLE YET LIGHTWEIGHT: Made from sturdy, water-resistant polyester fabric and spring steel wire. 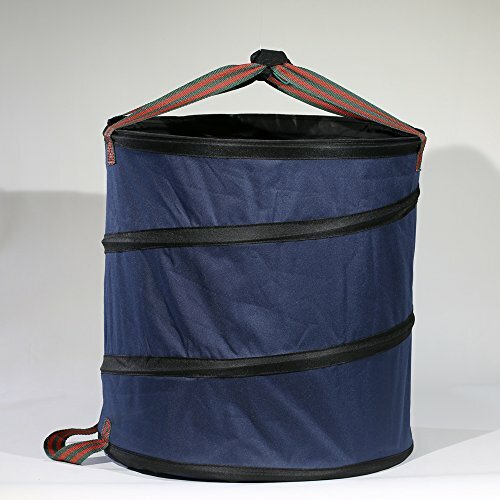 EASY CARRYING STORAGE: Bags are reinforced with two double stitched nylon carrying handles and one bottom tipping handle that make the bags easy to fill with waste and to dump waste out of them. When bags are not in use they can be collapsed and folded into a small square for fast and easy storage. MULTI USE BAG: Not just a gardening leaf bag. This nice-looking container is just as much at home indoors as a cool laundry basket, storage for kids toys and any other use you can think of. If you have any questions about this product by Mokylor, contact us by completing and submitting the form below. If you are looking for a specif part number, please include it with your message.